No one likes to bring bad tidings or to disturb fellow citizens sleeping soundly. So, with a heavy heart, I report that Lester Pearson (Canadian Prime Minister 1963-1968) provided confidential information to Russian Military Intelligence (GRU) while serving in Washington DC from 1942-1946, in his capacity ultimately as Canadian Ambassador. Unfortunately, this is not an isolated case. Treason is the secret policy of the governing elite in the West. Wittingly or unwittingly, they serve the Illuminati plan for "world government," an Orwellian police state called the "New World Order." Bill Clinton, George W. Bush, Ariel Sharon and Tony Blair are other examples. Illuminism believes that man (i.e. they) will define reality instead of God or nature. Thus, they have trouble with concepts such as objective truth or morality. Communism was established by the Illuminati to undermine the basis of Western Civilization (religion, race, nation and family) while pretending to build a better world based on equality and social justice. They duped millions of people, opportunists and genuine idealists alike. "Internationalism" which Lester Pearson advanced at the UN (winning a Nobel Prize in 1957) is a disguise for this occult tyranny of the super rich. Recent events (Sept. 11, the "War on Terror" Iraq and the Patriot Repression Act) must be seen in the perspective of advancing this grotesque plan. In August 1951, Elizabeth Bentley, a former GRU (Russian Military Intelligence) spymaster, testified that Lester "Mike" Pearson was a primary source. He fed confidential information to Hazen Sise, a Soviet agent under her control, who worked for the National Film Board of Canada. Bentley told the US Senate McCarran Commission: "I understand from Hazen that Pearson knew Hazen was a Communist and was willing to help. Pearson by virtue of his position used to sit in on American functions, particularly British ones re. British polices, all of which was super hush-hush." Pearson was Canada's Secretary of State for Foreign Affairs in 1951 so this testimony was kept quiet. It is included in Appendix A (p.186) of "No Sense of Evil/ Espionage: The Case of Herbert Norman" (1986) by James Barros, a Political Science professor at the University of Toronto. Herbert Norman, the Canadian ambassador to Egypt, was an NKVD agent and Pearson colleague who came under investigation in 1957 and "committed suicide." Pearson protected and covered for him. Lester Pearson may have been recruited while a student at Oxford University in 1923. From 1935-1941, he served at the Canadian High Commission in London and rubbed shoulders with the leaders of the world government plot. He helped to establish the North Atlantic Treaty Organization (NATO), and was the UN's point man during the Suez Crisis of 1956. J.D. Rockefeller referred to Mackenzie King as "my best friend." King worked for Rockefeller from 1914-1918 developing company unions and "social reform" policies that ensnared the masses and created big government. The Rockefellers, who are the American agent for the Rothschilds, have controlled the Liberal Party ever since. They use the Quebec-based Paul Desmarais family (Power Corporation etc.) as intermediary. The current Prime Minister Paul Martin is a former employee who is beholden to Desmarais for selling him Canada Steamship Lines in a sweetheart deal. In September 1945, three months before Elizabeth Bentley fled the GRU, a Soviet Embassy cipher clerk Igor Gouzenko defected in Ottawa with material documenting massive Soviet espionage in the West. Initially King ordered his officials to stall Gouzenko whose life, and that of his family, were in grave danger. They referred the heroic little family from office to office, crossing town with their incriminating documents. The Gouzenkos were told to return to the Russian embassy or commit suicide! Why? Ostensibly King didn't want to offend the USSR, a valued wartime ally. In reality, King, famous for being "inscrutable," was afraid that Gouzenko would reveal that the governing elite in the West was infested with Soviet (i.e. Illuminati) agents like himself and Lester Pearson. It appears that Gouzenko was saved because the Illuminati quickly devised a use for him. A top operative, "the Man Called Intrepid" Canadian William Stephenson, Head of British Special Operations Executive suddenly appeared and took the Gouzenkos under his wing. The trick was to create enough fear to justify the Cold War without exposing the top figures in the elite conspiracy, both in Canada and abroad. They sacrificed minor figures like atomic scientist Allan Nunn May, who was arrested for espionage and served six years. Meanwhile Lester Pearson and his high-ranking gang of elite traitors were unscathed. Meanwhile Gouzenko was kept in limbo; records of his interrogations disappeared, and the volume of Mackenzie King's Diary pertaining to the case vanished from the National Archives. Gouzenko was subjected to the usual slander from liberal and left circles. The same thing happened in the US when Soviet agent Whittaker Chambers defected in 1938. In 1939, he saw Adolph Berle, FDR's Assistant in Charge of Internal Security and fingered dozens of Soviet spies in key positions, including Harry Dexter White, who later became Assistant Secretary of the Treasury. Nothing was done. In 1948, to fan the flames of the Cold War, they let Chamber's charges against Alger Hiss come to the forefront. Hiss was a Soviet agent and a senior State Department official who advised FDR at the Yalta Conference. He also drafted the UN Charter and served as its first acting Secretary General in 1945. When rumors about him began to circulate, he resigned to become President of Rockefeller's "Carnegie Endowment for World Peace." Following Communist discipline, Hiss feigned outraged innocence and accused Chambers and his supporters of conducting a "witch hunt." He sued Chambers for libel and a 'who's who' of the Eastern Establishment came in his defense, including Felix Frankfurter and Adlai Stevenson. Unfortunately for him, Chambers produced documents in Hiss's own handwriting and Hiss went to prison for three years-eight months for the relatively minor charge of perjury. The British bewail the five high ranking Soviet "moles" in their Diplomatic and Security services. But the USSR (and Israel) were the creation of British Freemasonry. In other words, the British elite is at the heart of this world government conspiracy, which in reality is just British Imperialism repackaged. For heaven's sake, the fifth "mole," Anthony Blunt, was the Queen's personal art curator when he was "exposed" in 1979. I don't know how many counter espionage directors they have in London but MI5 Chief Sir Stewart Menzies instructed his counter espionage director Kim Philby to "look after" the matter. He did. Volkov and his wife were heavily sedated and flown to Moscow for torture and execution. Philby later retired in Moscow on the pension of a KGB General. Similarly Guy Burgess, Donald Maclean and the other more obvious "moles" in the heart of the British Foreign Service eventually retired to dachas in Russia. The BBC continues to portray them as idealists and rogue heroes. British atomic scientist Klaus Fuchs who betrayed the secrets of the Hydrogen Bomb to Moscow got all of 14 years in prison. He was released after just nine years and allowed to fly to East Germany where he became Deputy Director of Nuclear Physics Research. "Success" in the West depends in part on a person's willingness to betray his nation, race, religion, culture and neighbors. Conservatives and liberals alike had better wake up now before they have a rude awakening, in the form of martial law. There are no Starbucks in concentration camps (a.k.a flu "quarantine centers") and no one is going to escape this madness. The real battle is not between "left" and "right" but the age-old conflict between the super rich who want to monopolize all wealth, and the rest of humanity who seek a modicum to sustain a comfortable life. The enemy is not capitalism but monopoly capitalism, not corporations but cartels that strive for the ultimate monopoly, world government. Communism, or state capitalism, is a ruse by which the bankers co opted the collective instincts of mankind and harnessed our idealism to their diabolical agenda. The true enemy is not Islam but an ancient Satanic cult gnawing at the heart of Western society, intent on hijacking humanity from its healthy natural path, and enslaving it using sophisticated methods of social control. Like the Cold War, the War on Terror is a ruse designed to advance this process. Comments for "Lester Pearson, Illuminati Tool"
In response to the article CANADIAN PRIME MINISTER WAS "RED" SPY, is a document that should serve to awaken the people on this side of the Canadian/US border. Once again, the American people are far to slow to realize the New World Order is not concerned with the 'patriotism' being used to whitewash its intent. Once again I wish to remind the American public that in Germany in 1933, it was the Nazis that bombed the Reichstag building, claiming it was a 'foreign threat' against yet among the German people. On 11 September 2001, a similar miliary action took place, blaming 'muslim fanatics' who hated the USA, crashing planes into the World Trade Center Towers in New York City and the Pentagon in Washington, DC. There was supposedly no doubt what happened even days after, now look at all the unanswered questions. It seems that a guided missile hit the Pentagon rather than a 767 passenger plane like we were told. Now, what was seen on television cannot be claimed to be what actually happened, even with what was seen (look on www.911letsroll.org or www.whatreallyhappened.com)! The brilliant author Kurt Vonnegut Jr. suggests President George W. Bush be impeached for the crimes his administration has perpetrated against Afghanistan and Iraq, and the lies he has thrown onto the American people. I have to say I am with him! Sadly, Vonnegut suggests there is not going to be anything of this country for his grandchildren and great-grandchildren. I truly doubt if there will be a country called "America" when Bush and his 'bosses' (rather 'handlers') are finished! These would be the international banking (cartel) system centred in the financial district of the City of London. Here North America is still considered a 'British colony', and thanks to the Virginia Company still under the auspices of the Crown. That means America being a 'free country' has all been a lie, while we just sit still being covertly owned by the British Crown! Countries and borders mean nothing to the New World Order, and why should it since they only want one thing (EVERYTHING!). Here's what I wish 'America' WOULD be known to the rest of the world as AMERIKKKA. Especially with that way corporations are now pushing GM or 'genetically modified' crops in an effort to contaminate organic crops. Canada is suffering with this as well, but thanks to a hand full of farmers, they will not give up the fight for corporate gains. Truly I wish more Americans were in the know about some of these "silent weapons for quiet wars". I personally wish more people on this side of the border were able to see what they are really up against with the current adminisration. Mainly, one needs to look beneath the surface rather than the window dressing on top. This is what I believe your article on the Canadian Prime Minister is used to illustrate. Hello my name is Keith from Chicago. I have been reading from your web site since 2002 and I must admit it has help me to understand the why and the who's. for years I have always felt inferior because I grew up a poor African American. after watching so called comedy like good times about poor black people in the projects. after reading your articles I realized I was the victim of class warfare. then I learned there is a war on humanity not just black people. so now don't blame white people for anything I don't blame Jews or Christians Muslims or Catholics. because I know now that threw the bilderbergs, council on foreign relations and the trilateral commission. they control every part of American life. I wanted to know why you never do articles on the mass poisoning of the American food supply and water supply. I have found out that 80% of what the American people eat is genetically altered and synthetically grown. the water has been poisoned purposely with fluoride and mtbe among other cancer causing agents. so this is done to advance the new world order agenda by making the American people so sick and unable to think because our body's have been deficient of naturally grown organic foods .so now years later we are the sickest population of people on the planet. so you cant expect people like this to be alert and be able to do critical thinking and recognize that the media and the American education system has made us the un aware of what's really going happening people in the western hemisphere. so doing an article on how the Rockefellers and the rothchilds etc... are killing us with the sweetest agent they have high frucose corn syrup and refined sugars. a healthy population will be more alert and the biggest threat the new world order because once that happens we as Americans will realize that the old divide and conquer tactic is has been used against us. you will find, are nonsense. do was to keep following the leads he was developing. He was going to show that the pillars of society were supporting communist subversion. That was McCarthy's sin. Saw your article on Pearson. Very good. But wouldn't it be more accurate to say that he was first and foremost a British agent taking orders from London. He was a spy for the British and since they manipulated USSR they got him to leak intel to Russia? Wasn't he a British agent and British spy rather than first and foremost a Russian Spy? Indeed when we realize that "British" and "Russian" are run by the same Masonic crew. prominence, the game was in full play and the chance for any real independent role for Canada was gone. cosmetic battles with the US. Wouldn't you say that is the bottom line? I suspect Canada's relationship with the UN is very close. I was going to say "strong" as in Maurice. Our relationship seems to have been that way since the UNs inception. I am surprised Mr.Turdeau(sp) didn't go to work there after his retirement from Canadian politics. Once again I am not really interested in whether or not the men in the "illuminati" are Jewish, Athiest, Christian, Muslim or Luciferian. To me it is irrelevant. I think, by reading some of your readers responses religion is a major factor. Perhaps that is the only way they can see men as being truly evil. They attempt to portray them as different when in fact they are the same as any other man. First of all, sorry because I'm not good speaking in english but I'm gonna try to make sense of my speech here. I'm from venezuela, here we have a president who told us just a few month ago, We have to change the old order in our world and go for a new world order. His name is hugo chavez frias and he is beyond all doubts trying to advocate socialism, a new socialism that will lead us to a new way of living, a better system of society but actually he is working along with people like Fidel Castro among others, his have been using the oil and is bribing the nations of south america for implementing the great union, I'm afraid that it is going to happen sooner of what I've actually been expecting so to happen. In my understanding he is not against bad people, quite on the contrary, he belong to them without hesitation, it is not strange to think that he was trained like a puppet into accepting socialism and ideas from the illuminatis long time ago. He is stating the heroe that was karl marx, besides, he is against capitalism like a system in our society but from the outset his government has retain great power like never before has happened in our country like a good socialist would do. In a nutshell we have no hope in our world, jesus christ told us my government is not from this world, so we have been condition to believe in a posible messiah, when in reality we are all being conveyed on by the hand of illuminatis for the ultimate goal THE NEW WORLD ORDER. Our confidence in not in men but jesus christ, more than this will be deception. Amen. Thanks for your latest article in which I found this key phrase: "Success" in the West depends in part on a person's willingness to betray his nation, race, religion, culture and neighbors. Until today, few have understood this, even among those who see the chaos in which we live. Communism was a lie, that of the achievement of the universal brotherhood. Even if many people inside the system could feel in their every day`s life that it was a lie, they were willing to keep this lie alive as long as possible. That was the main force of the communism: it was such a beautiful dream that most people didn`t want to be wakened from it, even if their bed were burning. I know this for having myself participated to it during the first part of my life. The form of ultra-liberal capitalism in which we live is a lie too. Most people think that the name of this lie is "democracy" or "freedom". But it is not. In fact, it`s difficult to find a person believing seriously that the current form of capitalism has anything to do with democracy and freedom. Ultra-liberalism doesn`t need people lying to themselves that they are free and living in a "democracy". The system is staying alive by the force of another lie, far much stronger. The lie of -as you say it yourself- "Success in the West depends in part on a person's willingness to betray his nation, race, religion, culture and neighbors." While the communism was cimented in the lie of a true great spiritual value being achieved -that of the universal brotherhood- the nowadays capitalism keeps itself alive by destroying the human soul. This means that the ultra-liberalist propaganda is not intending to make believe in the achievement of any spiritual value but rather to make believe that no such values are existing. The brainwashing we are submitted to is intended to transform us in human sharks led by the idea that there is no alternative to the "devour or be devoured" world. This is the biggest lie ever forged by an "elite" of lost souls to take control of the masses. 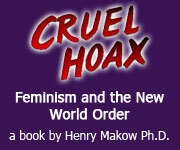 Thank you, Henry, for contributing with your messages to crash down this devilish lie. are much more profitable; much, much more. People think that the Devil is as powerful as God. He is not. He is not even close. liars and cheats would suffer. It's one think to talk, it's another to put your money where your mouth is, and that's just what honest Christians have been doing for hundreds of years. There are phoney churches out there, sure enough, but the honest preaching of the Word of God is still going on. God is still in the saving business. God is still in the redeeming business. God is still in the Truth business and the sheep of his pasture know the shepard's voice, which is the Bible.